You have found my best pancake recipe. Say goodbye to Aunt Jemima after you taste these babies. The family will be asking for pancakes from scratch for now on. Homemade pancakes so fluffy and delicious - just add a bit of fruit (frozen blueberries are wonderful), for a real treat. These flapjacks are so fluffy and delicious - just add a bit of fruit (frozen blueberries are wonderful), for a real treat. Or you can add 1/2 tsp of cinnamon and top them with apple pie filling. Yum. If you want, mix up the dry ingredients in advance and give as a gift with instructions. You can also store this so on the weekends it's "almost" ready to go. Great way to save money; now on to my easy pancake recipe. Mix the dry ingredients together in a mixing bowl and set aside. Whisk the egg into the buttermilk mixture and then add the vanilla (and almond if using) extract and cooled melted butter. Whisk this buttermilk mixture in with the dry ingredients. Heat up a pan to medium and add some butter (or oil). To make a test pancake: add 1 tablespoon of the batter into the hot pan. When browned on one side, flip over. Now you are ready to make regular sized pancakes. Pour 1/4 to 1/2 cup of the batter into the hot pan after it has been sprayed with oil. When bubbles form on the top, flip it over. Repeat until batter is gone. **Buttermilk substitute is 3/4 cup milk (I have used powdered milk with success too) plus 1 TBS vinegar or lemon juice. Whisk together and let sit 5 minutes. 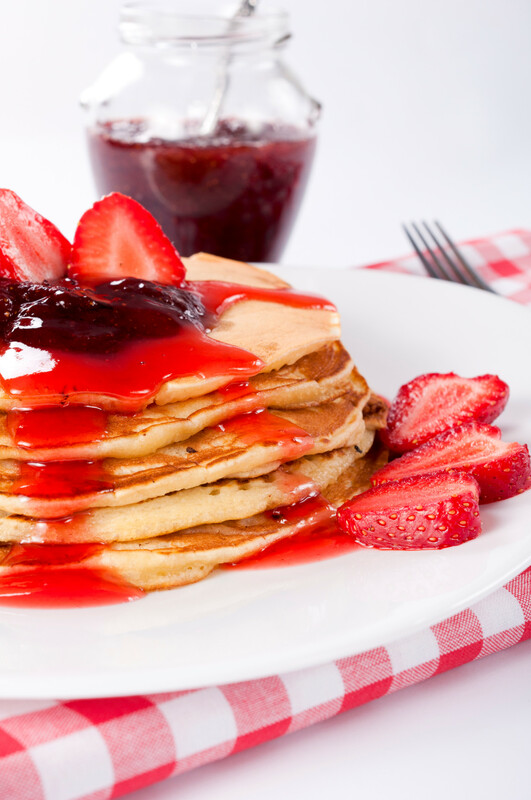 I really enjoy the strawberry jam instead of syrup and have been eating them this way for years. When I use a little bit of almond extract and cook them in butter - I just eat them plain or sprinkled with powdered sugar, they are that good. Enjoy. Preheat skillet over medium heat. Use a pan with nonstick surface or add a little nonstick spray. Stir together the flour, baking soda, baking powder,and salt. Mix the egg with the buttermilk and add to the flour mixture, stirring only until smooth. Add the melted butter and sugar.